Jordan Wells Paving Asphalt Driveways, Parking Lots, Roads and Sealcoating Contractor Richmond, VA and Surrounding Areas. Residential/homeowner asphalt paving services we offer: Driveway crack and pot hole repair, resurfacing or rehabilitation, new installations, grading for water runoff (no ponding on driveway) and application of all types of sealcoating for maintenance. ​We offer installation of tar and chip driveways- a less costly; yet durable option for the homeowner. Please contact Jordan Wells Paving at (804) 823-7644 to request a complimentary on-site consultation and estimate! If you’re not 100% satisfied with our assistance, be sure to let us know! We guarantee our services and will do our best to ensure that you are another satisfied customer! ​We offer our residential paving services to all clients, regardless of the size of the job! If your asphalt driveway is cracked and invaded by grass, faded or failing completely, let us help you. How to decide if replacement of an old worn out asphalt driveway is necessary or if instead it could be resurfaced? You could start by getting three or more asphalt paving contractors that have been in business 5 years or longer within the Richmond area to come and inspect your driveway. During the inspection, they should take measurements and gather information on any unique needs that you may have, such as parking a camper on the driveway or a heavy work truck. If the driveway is more than 15 years old and has several patches of Alligator cracking, replacement is a necessity. 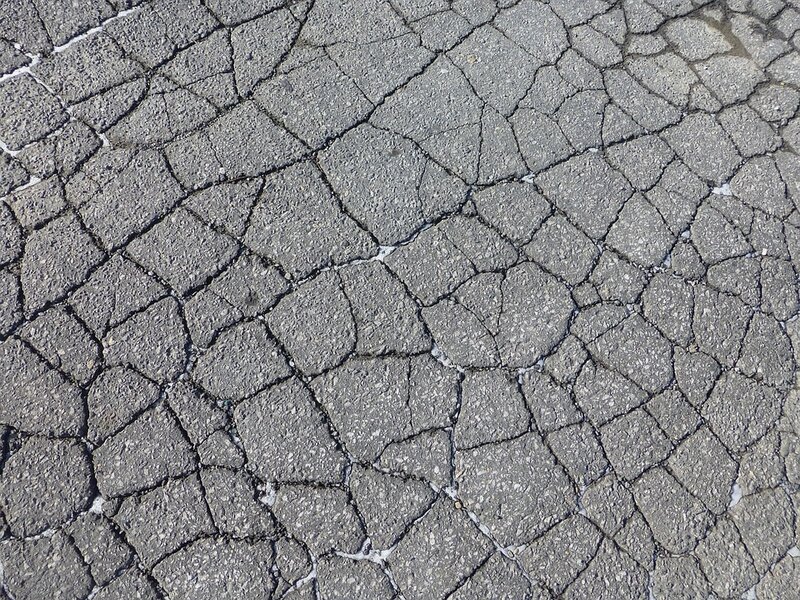 Driveways with alligator cracking cannot be patched over because the subbase's unstable movement is beyond the ability of the asphalt to flex with it so patching it will only cause the cracking to appear again only this time pushing repair material out of the cracks. 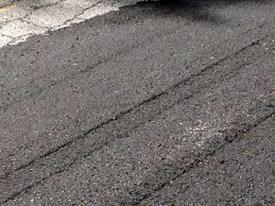 When the Asphalt pavement is too old to flex anymore, it will appear light gray in color because all of the asphalt binder (sticky black glue-like substance) has been oxidized (dissolved) so you will see the lighter colored exposed aggregate. This is a quickly deteriorating pavement and soon you’ll have pavement crumbling which leads to further destruction of the subbase. Call Jordan Well Paving (804) 823-7644 before the driveway’s subbase also needs rehabilitation. Tire Ruts caused by a too heavy truck using driveway. Jordan Wells Paving services for homeowners covers all aspects of design and building a new driveway- including regular maintenance through the process of sealcoating and crack repair. We pay attention to all requirements needed for a strong trouble-free asphalt driveway. We start with expert grading or excavation- a very important consideration to the longevity of your new driveway, and one of the most ill handled aspects of Asphalt driveway installations. Low bids from a paving contractor may indicate intentions of skimping on the base preparations. For example, when a contractor inspects the base soil (you should check with them) and finds clay type soil be aware this needs a thicker compacted subbase then what needs to goes over well-drained sandy soil. Be sure to ask each contractor to prepare cost estimates quoting only compacted inches for each layer of substrate for the driveway- only then will you get a true basis for comparison between bids. Grading of the subbase should send the flow of water to one side off the driveway to spread out over the ground. The base soil will determine the depth of the crushed gravel base. The area to be paved should be treated with vegetation inhibitor to keep weeds from breaking through the blacktop. The crushed gravel base should be minimum of 4 inches (more is better) under the blacktop layers and should extend beyond the edges of the driveway to stop water runoff from flowing under the driveway into the base. Water is what erodes the gravel base causing cracking or failure of asphalt driveways. Cars and light-duty trucks are the designed traffic for a residential driveway. If you have a camper to park on your driveway, the driveway design should support a heaver load. Compaction should be checked for thoroughness, and repeated till solid. Compare our directives to other asphalt paving contractors practices. Our experience and commitment to offer our customers the highest quality of workmanship at the lowest price point has kept us in business the last 10 years. A well-maintained driveway will increase your property value in the sale of your home. Most people believe, and rightly so, that if you take care of the outside maintenance of your home, the inside has also been maintained. Many home buyers will pass by a home with a deteriorating driveway, but with a well maintained beautiful driveway they will take that extra step to view your home. We have even installed the occasional basketball court- so if you have a need for any project that uses Asphalt paving please give us a call. When you call Jordan Wells Paving (804) 823-7644 for a complementary on-site estimate, we will quickly respond and schedule at your convenience a time to look at the property. Once there we will listen to your needs and discuss the consequences of different approaches. After evaluating all information gathered, we will quickly draw up a written proposal and at your preference text it or deliver it in person. We want to give reassurance that should you ask for a pricing estimate we will not suggest a proposal that is camouflaging a serious underlying problem such as, repairing an ailing pavement with crack patches and sealant when it should instead be milled and paved- removing enough thickness to level and smooth the surface. Nor will we suggest doing work that does not need to be done. Our estimates will consider clients’ needs, desires, cost, longevity and appearance. It’s a false economy to repair the surface without addressing the causal agent of deterioration- you may have to go through another repair in a few years. We will give you the tools to decide your most cost effect and appropriate repair or installation that will provide years of trouble free service for your property, and enhance its value.